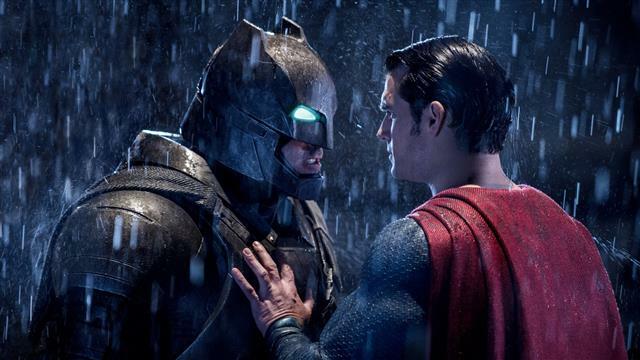 Batman and Superman are proving a huge draw in their first meeting on the big screen. Zack Snyder's Batman v. Superman: Dawn of Justice -- starring Ben Affleck and Henry Cavill -- is off to a superhero-sized start at the North American box office, where it's on course to earn $78 million-$83 million on Friday for a weekend take of $160 million-$170 million, putting it among the top five superhero films of all time, according to early returns. Some even are betting it could hit $175 million. Either way, BvS looks to easily best the $152.2 million debut of The Hunger Games: Catching Fire in 2013 to mark the best March opening of all time. The movie, costing at least $250 million to make before marketing, is a defining moment for Warner Bros. as it looks to both improve its box-office fortunes and launch the DC Entertainment cinematic universe. Friday's haul will include $27.7 million in Thursday night previews, the seventh-best preview gross in history, besting Avengers: Age of Ultron's $27.6 million (Star Wars: The Force Awakens set a new record for previews in December when it took in $57 million). BvS now also holds the highest Thursday preshow score for Easter weekend, eclipsing the $15.8 million earned by Furious 7 last year. Of its $27.7 million tally, $3.6 million comes from Imax (which is also their largest Easter preshow number ever). The superhero film is opening around the globe, including in China, where early Friday shows already have grossed a strong $21.2 million. BvS began rolling out Wednesday in select markets, grossing $44 million in its first two days for an early foreign cume of $44 million and a global tally of $71.7 million. The movie is prospering in Europe, where it scored the biggest opening day of the year to date, beating Deadpool. And in Germany and several smaller markets, it scored the biggest opening day of all time for a superhero movie. BvS sees Batman (Affleck) and Superman (Cavill) battling it out as Lex Luthor (Jesse Eisenberg) brings to life another deadly threat to the world. Wonder Woman (Gal Gadot) makes her first appearance ahead of getting her own stand-alone movie next year. Warners' first Superman film starring Cavill, Man of Steel, which opened in June 2013, earned $9 million Thursday night (plus $12 million from special screenings co-hosted by Walmart and Warners), and went on to earn $116.6 million in its domestic debut. My Big Fat Greek Wedding 2, the follow-up the 2002 original hit, is the only other new release over Easter weekend and hopes to be a big draw for older women not so interested in the showdown between the Caped Crusader and the Man of Steel. The Universal sequel, written by and starring Nia Vardalos, is expected to open in the $10 million-$15 million range. Gold Circle Entertainment, HBO and Playtone produced the film. My Big Fat Greek Wedding 2 nabbed a solid $1.02 million on Thursday from 2,395 theaters after showings began at 6 p.m.